Many homeowners in Wisconsin have a long list of outdoor projects that need to be tackled in the spring and summer months. These projects could include anything from a new patio, to installing a fence, to simply planting a garden, shrubs or trees. Before completing outdoor projects, homeowners should contact Diggers Hotline by calling 811 or making an online request at Diggers Hotline's website. 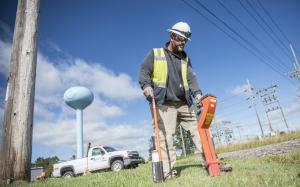 Utilities, including Oconto Falls Muncipal Utilities, will respond to you your request and will mark buried lines. Respect the marked lines and dig carefully.